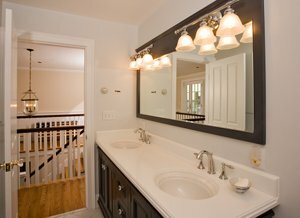 Invest in a Wenham MA bathroom remodeler you can trust. O’Neil Fine Builders is dedicated to making remodeling dreams reality. Offering in-depth design-build services, our home improvement company takes into account everything from A to Z. If you are looking for a bathroom remodeler in Wenham MA, give O’Neil Fine Builders a call today. What are you looking for in terms of comfort, utility and design? Bathroom remodeling is perhaps the most intricate of all home improvement projects. From flooring and lighting options, to fixtures tiling, moulding and surrounds; there are tons of things to consider when re-designing your bathroom. O’Neil Fine Builders is here to assist you every step of the way. Our Wenham MA bathroom remodelers install porcelain and cast iron tubs, as well as sliding glass doors if you prefer. The experts at O’Neil Fine Builders work to get your new bathroom just right. Call or email O’Neil today for a bathroom remodeler in Wenham MA you can trust. In 1990 Jim O’Neil founded O’Neil Fine Builders with a vision of quality. Today our home improvement company is the North Shore’s premier design-build contractor. When you invest in us, you invest in the best. Call us at 978-927-7711 or use the contact form to your right to set up an appointment with one of our bathroom remodelers in Wehnham MA.